A picture of the nose will help. Is there a data tag somewhere inside the coach? I do not think this is a Barth with the rubber strip on the bumper. This Rig sure has a long overhang past the rear wheels. Maybe it belongs in MAHEM? Not sure but I think it was in Sightings a year or more ago. Thank you guys. The paperwork says it is a Barth. I was hoping someone here could tell me which model of Barth. Is it a Breakaway? The front bumper does not match up with anything I can find, but the grill and headlights do. I will be going to where it is being stored later this week to look for the info tag and see what else I can find. Pictures do not appear like the eyebrow of a Barth. If you post a picture of the data tag from this unit showing it is a Barth, I am sure Bill or Rusty will move your pictures back to Pictures of My Barth forum. Take a look at our pictures in the picture gallery on the home page. I would like to see the overall length. It appears to be longer than any P30 we've seen without a tag axle. 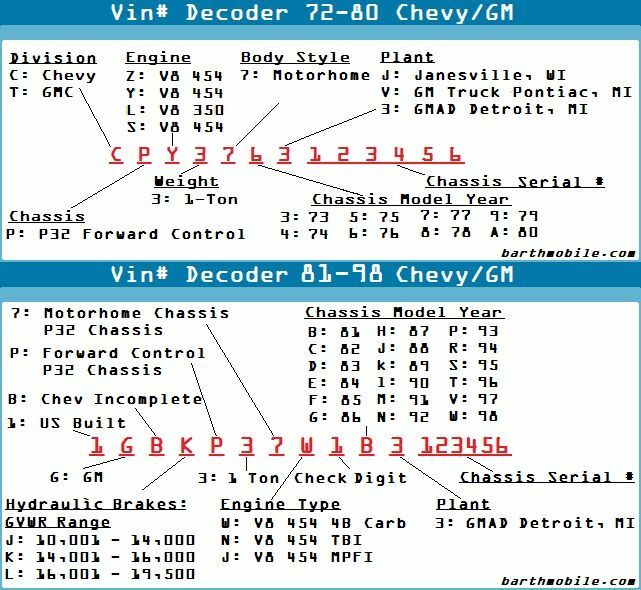 I believe 31 ft is the longest non tag GM chassis we know about. Considering this one would have been built at the tail end of Barth's run, I guess anything is possible. It was obviously some kind of commercial unit with the two doors and the plain interior. Is it all aluminum skin? We saw at least one 94 Monarch style Regal with fiberglass sides, so anything is possible. If it is a Barth it is an orphan among orphans! Keep us posted. No doubt in my mind!! It's a BARTH. Cadillac Headlights, front grill, Corrugated metal in the middle. It is a Barth. Take a look at the commercial Barths (Data Tag Project) built by Barth RSV post 1994. They have the same bumpers and 1 piece molded front ends. Does look like 32+ ft. long. Data Tag would be nice. The nosecap is completely different from any Barth I've seen...it's a one piece, with a definite bend in the brow. The windshields are neither of the two common ones in Barths, as they don't curve to the sides. The wheels appear to be 16", which would be unusual for a Barth of this size. The bumper is mounted high To stay on the nosecap, which doesn't fair in with the front sheetmetal. motor HOME. As Doug suggests, it was probably a mobile health dept unit. Just another piece to our puzzle! I will get out there as soon as life will give me a second. I can't tell you guys how much I appreciate your help. On other auto forums, I'm usually the guy helping people, so I know it takes time. More to come! It appears correct for a 1994 with TBI 454. However, this is not a Regency. All Regencies were diesel pushers. You have a Regal model, or more likely, a specialty model. good luck with your Barth! Regencies have a taller roofline. It does not look like you have the roofline from a Regency, although better pictures would help. As far as your title, my Barth was titled as a Baronet. It took an attorney to prove to the Bureau of Motor Vehicles that it had no wings like airplanes do. I could not find any Regencies in our data tag project listed as mobile office Regencies. It is a specialty vehicle. As soon as we see the Barth data tag Bill NY will get you a personal Barth folder.